Bring a saucepan of unsalted water to the boil and add the drained chick peas. Reduce the heat and simmer for one hour or until the chick peas are soft. Drain and leave to cool. 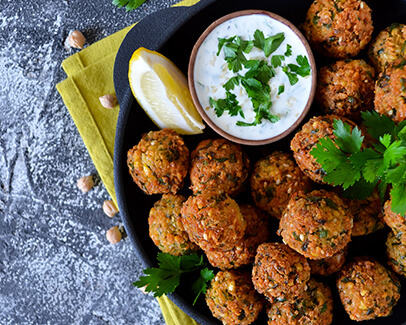 Put all the falafel ingredients except the olive oil in a food processor and whiz until coarse; do not allow the mixture to become smooth. If you have time, make the mixture in advance and chill in the fridge for a few hours to allow the flavours to infuse. Form small handfuls of the mixture into 12–16 balls. Wearing plastic gloves makes the falafel easier to handle as they stop it sticking to your hands. Grease a baking tray with the olive oil and place the falafel balls on it. Bake it in the oven for 30 minutes or until golden brown, turning once. To make the relish, chop the tomatoes and cucumber into small cubes of uniform size. In a bowl, mix the tomato and cumber with the soya yogurt and mint. Warm the pitta breads in the oven for a few minutes, not allowing them to go crispy.